There’s a minor blogstorm developing around a report from Bill Theobald in USA Today about Fred Thompson’s answer to a question as to how badly he wanted to be president. In a dispatch today from Burlington, Bill quotes the former Tennessee senator as saying he doesn’t like modern campaigning, isn’t that interested in running for president and “will not be devastated” if he doesn’t win. More of the “Lazy Fred” meme. Color me unsurprised. I suppose it’s been several generations that the press has not seen the kind of politician that we used to have in this country near its founding, where every waking moment of a candidate’s life was taken up with government. So it is their reaction to such a pol is one of fear. Back in the day, we had citizen soldiers, and citizen politicians. The soldiers were called up when needed, offering themselves to the service of the country. They didn’t make a career generally speaking, out of being soldiers. Politicians of the day were pretty much the same way. They served a few years in their various legislative bodies, and went home. their lives didn’t end when their governmental power did. …I came away from the report with the right impression: Thompson thinks he’d be a good president, would work hard if elected, but he’s not going to be devastated if he doesn’t win. Like, his saying this is supposed to bother me? I’ll tell you the truth… what bothers me more is Hillary Clinton, whose every single breath is consumed in attaining power. Who does the country have more to fear from? The latter, I think. That as I see it is the difference between Fred Thompson and Hillary Clinton. 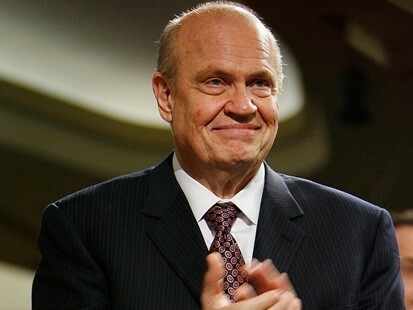 Of those two positions, I find Fred Thompson’s infinitely more attractive. Right Wing Nut House, Flopping Aces, Wake up America, Stop The ACLU, The Carpetbagger Report, NewsBusters.org, Blue Crab Boulevard, The Sundries Shack, Memeorandum has more. A major difference between Fred and Mrs. Clinton is that Fred defends himself without getting shrill, invoking the need for some grand conspiracy and with facts. Listen to Fred make his case. Also, unlike Mrs. Clinton, Fred takes and answers questions. Hat Tip: Allah Pundit, Hot Air.